This 56yrs lady attends for a well-woman BP check. After 3 repeated measurements, a minute apart, her mean BP is 146/90 so the Practice nurse decides to do an ECG, in accordance with the practice protocol. Does she need any further investigations? This ECG is compatible with Left Ventricular Hypertrophy (LVH). It shows voltage criteria for LVH, in leads I and aVL. As no other criteria for LVH are met, it is often better to say “This ECG meets the voltage criteria for LVH”, rather than diagnose hypertrophy. In accordance with latest NICE Hypertension Guidelines, you may want to offer this lady an ambulatory BP monitoring (ABPM), or Home BP monitoring (HBPM), for confirmation of diagnosis. Her CVD risk, and any target organ damage, should also be assessed. Whether she turns out to have Stage 1, or Stage 2, Hypertension on the basis of her ABPM, her LVH will certainly sway you towards a lower threshold to treat. Unless it is likely to change your management plan, an ECHO is not necessarily required to confirm diagnosis of LVH. (See 2011 NICE CG127 Hypertension Guidelines for care management pathways). 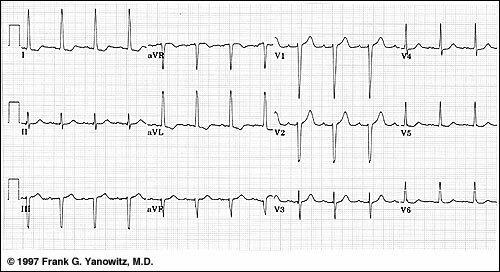 The main purpose of showing this ECG is to discuss the various voltage criteria for LVH. Don't just look at the chest leads! Interestingly, there is no one universally agreed criteria for diagnosis of LVH by ECG. A few of the more commonly accepted ones are listed below. A normal Left ventricular wall is 9-11mm thick. Larger than this is defined as LVH, and can only be diagnosed by ECHO measurement. Various ‘voltage criteria’ seen on ECG, however, can be suggestive of LVH. The Left ventricle is represented by leads v5 and v6, so in LVH, we expect the ‘R’ waveforms to be enlarged/tall in these leads. (Conversely, we expect the ‘S’ waves to be deep in the right ventricular leads, that is V1 and v2). Generally speaking, the predictive value of the voltage criteria is cumulative. i.e. The more voltage criteria met, the greater the likelihood of LVH. In the ECG above, the precordial leads do not meet the voltage criteria for LVH (arguably borderline, I admit, at 35mm). Many clinicians are aware of the R and S wave criteria in the precordial (chest) leads, but this can be dependent on body habitus. The chest leads placed on a tall, thin man, with little adipose tissue, are in close proximity to the heart so naturally, the waveform amplitude in the chest leads will be large. The limb leads, being less affected by body habitus, are often more reliable in these individuals. Voltage criteria for LVH in V1-V6 alone, in a tall thin person, without other cause for concern, it not necessarily and indication for an ECHO. If a patient with LVH criteria on ECG is hypertensive, then arguably, an ECHO is only helpful if it will alter your threshold for treatment. If you plan to treat anyway, an ECHO is of dubious further value. · The strain pattern is greatest in the lead with the tallest/deepest QRS complex. (seen in Lead 1 in example above). Interestingly, there is no one universally agreed criteria for diagnosis of LVH by ECG. I'm sorry to hear that. I hope the repeat check up is fine. If so, what a shame you've been put through all that unnecessary worry. This is a typical example of unecessary screening - a problem about which many doctors are becoming increasingly concerned. If your blood pressure was found to be high, then requesting an ECG may have been appropriate, but in the absence of any symptoms or signs, it has the potential to cause more harm than good. Good luck! Hope all goes well. H.
Whilst the specificity of ECG to predict LVH may be low, it is useful to pick up cases of genuine LVH (due to HCM, Fabry's, Aortic valve disease, long standing hypertension etc., remembering there is no absolute need to have a family history of HCM with a new diagnosis). Thank you. I totally agree that 'when there is concern' an ECHO is a safe and reasonable non-invasive test. On the other hand, where there is no concern, no symptoms and inconclusive criteria for LVH, any medical investigation has the potential to cause more harm than good through psychological morbidity. As doctors we have a duty to bear this mind, and fully discuss the pros and cons of investigation, with the patient, in every case.